At the beginning of each month we senda list of upcoming events within 300 miles of the recipient’s zip code. The email includes the dates, organization, location and direct link to register for the event. If you’re using our Google Analytics integration, you can track clicks from these emails with a campaign source of “msr-calendar” and name like “Jun13”. 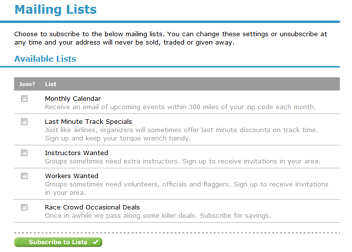 Like the airlines, this list is for last minute discounts on track events. When an organization is running into problems filling an event and needs a last-minute bump, we can send a blast to everyone within 300 miles of an event. We exclude anyone already registered to reduce the chance of an existing registrant becoming upset by a late discount offer. Attendees can now sign up to receive invitations to instruct at local events when an organization is looking for extra help. Like with the Last Minute Track Specials, organizers can contact our customer service and request a blast for their geographic area. We recommend promoting this list to your instructors as the larger the pool, the higher chances someone will respond to help when you need it most. You can, of course, review an instructor’s registration history and log book entries to help vet their experience. Don’t turn away students and entry fees because you’re short instructors! This list is basically the same as the Instructors Wanted list, but for workers. Put the call out and we’ll help you rally the troops. Same karmic belief here: if everyone promotes it to their workers, there’s a better chance that help will come when you call. It’s like GroupOn for motorsports. Except not every day. Because otherwise you’d never make it out of the garage with your driveway blocked by FedEx boxes. You know the drill; basically we twist the arms of our vendor friends to unload products and experiences at a steep discount exclusively for MSR users. If these are regional deals, we’ll only email you if they’re applicable to your area.